A blockbuster matchup was over before it started Saturday as second-seeded Rafael Nadal withdrew ahead of his semifinal clash with No. 4 Roger Federer at the BNP Paribas Open in Indian Wells, Calif. The Swiss star, seeking his sixth title at Indian Wells, advances to face Dominic Thiem in Sunday's final. The seventh-seeded Austrian held off No. 13 Milos Raonic 7-6 (3), 6-7 (3), 6-4 in Saturday's other semifinal. Thiem is playing for his first ATP Masters 1000 title, having lost in two previous attempts. His victory over Raonic came in 2 hours, 34 minutes in what was a tightly contested affair. In playing tiebreakers across the first two sets, neither Thiem nor Raonic broke the other's serve. Thiem had one chance in the fourth game of the second set but failed to convert. While Thiem jumped out early in claiming the first tiebreaker, Raonic wouldn't let the same fate befall him in the second. The Canadian won the last five points from down 3-2 to force the decisive third set. There, Thiem and Raonic continued to hold serve until the Austrian finally converted the match's first and only break in the fifth game. 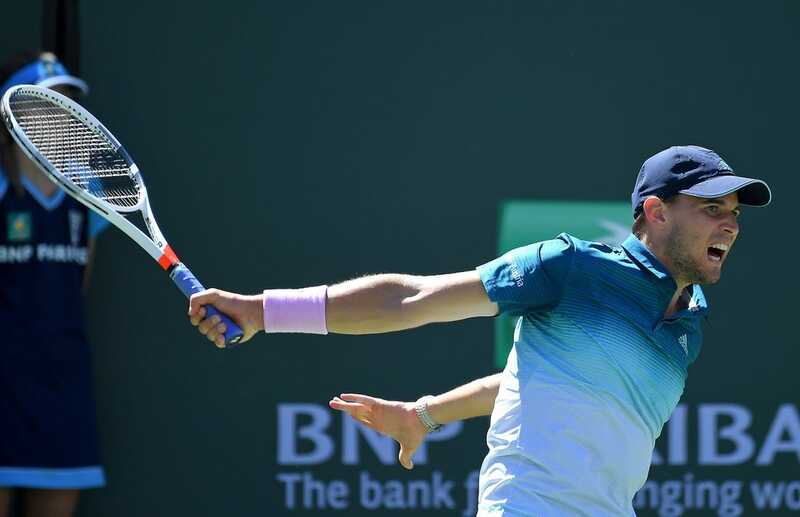 Thiem would hold off a break point in the final game, converting on his second chance at match point on a crash at the net for his 25th winner of the bout. Raonic held a 17-5 edge in aces, but Thiem won 77 percent of his service points.